Elements Europe has commenced delivery of Room Modules to a student accommodation scheme in Plymouth’s City centre. The main contractor on-site is sister company Pickstock Construction, specialists in the development of modular buildings. The site will provide Plymouth students with state of the art accommodation comprising of two tower blocks one standing at 13 storeys and the other at 10. Elements Europe will manufacture 348 student Room Modules which will be installed into the 13 storey tower block with the adjacent 10 storey facility being built traditionally by Pickstock Construction. Elements Europe, will however manufacture 60 Bathroom Pods to be installed into this block, therefore eliminating major M&E works. The modules will be delivered direct from Elements Europe’s production facility in Telford to site in Plymouth where they will be installed upon arrival over a three month period using one of the two tower cranes on-site. “Pickstock Construction and Elements Europe’s experience in working together will ensure that the modules are installed in a fast and efficient manner” he added. 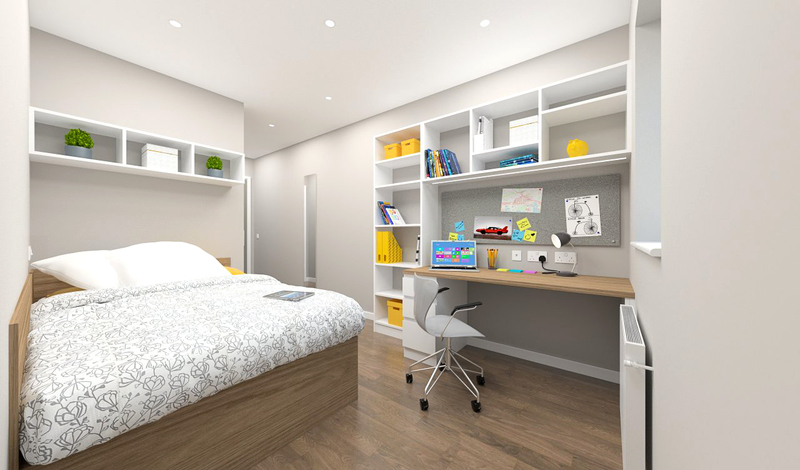 The accommodation will offer students a choice of studio and en-suite rooms. Elements Europe will also manufacture kitchen modules for students occupying cluster flats. The modules have been designed by The Pickstock Group and offer the latest contemporary student accommodation with space and functionality in mind. Pickstock Construction is a specialist modular contractor. Since its first modular hotel project over ten years ago, its expertise has grown to deliver multi million pound modular developments to hotels, student accommodation schemes and healthcare developments.